Thanksgiving marks the beginning of the holiday season and the fun festivities of the months ahead. Family and friends are set to gather together to share a meal; spend time with one another; and take time to remember and appreciate the wonderful blessings in their lives. Beginning as a celebratory feast in November 1621, when the Pilgrim’s corn harvest first proved successful, Thanksgiving has since become a time in which the country comes together in gratitude. This holiday is simple – good food, family and friends, and maybe some football! It is a time to share with those we love in creating lifelong memories. Because we will be opening our doors to holiday guests, friends or neighbors stopping by, the weeks leading up to Thanksgiving are the perfect time to spruce up your home with harvest accents that are set to impress. At The Magnolia Company, we have a large selection of Fall accent pieces and decorations that are hand-crafted by the “team” at our family farm. Our team includes designers, horticulturists and craftsmen working together to make your family’s Thanksgiving one they will always remember. Dress up your front door, entryway or dining room table with an accent piece from our Turkey Pheasant Collection. 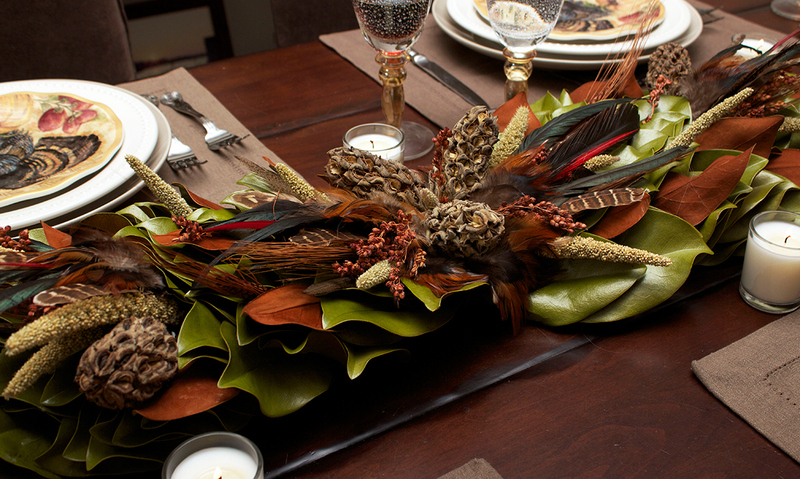 Weaving together our green magnolia leaves with warm copper accents and pheasant turkey feathers, these pieces are set to impress. Choose from a wreath, centerpiece, traditional cornucopia or basket to bring the appropriate harvest look to your home. A single selection will be a stunning addition to your décor. Choosing all four pieces will weave this theme throughout your home for an impressive look. Brighten up your home with pieces from our Golden Aubergine Collection. 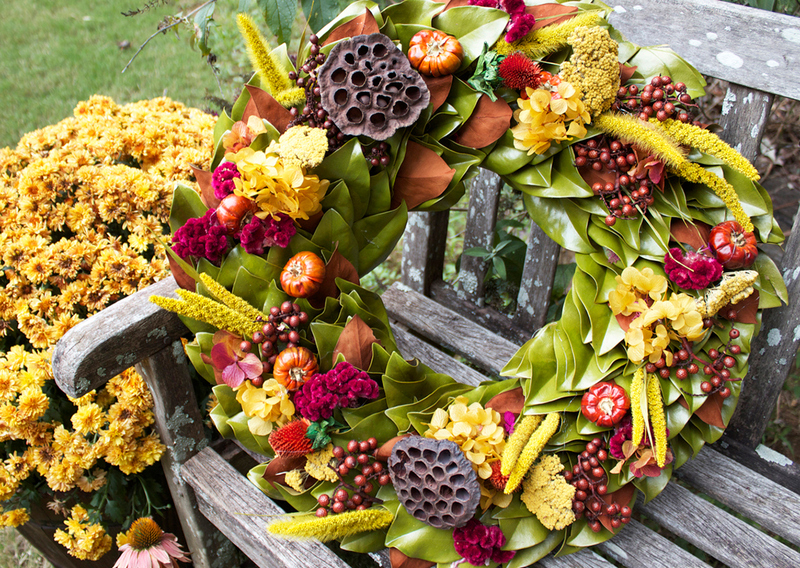 These wreaths and centerpieces create bold displays of color with bright yellow hydrangea and yarrow woven amongst lush green magnolia leaves, berries, and mini pumpkins. A great choice for your front door, dining room table or buffet, these items will not go unnoticed. If you are looking for home décor that will lend nicely with your Thanksgiving celebration and also help you ring in the upcoming holidays, look no further than our Season’s Bounty Collection. 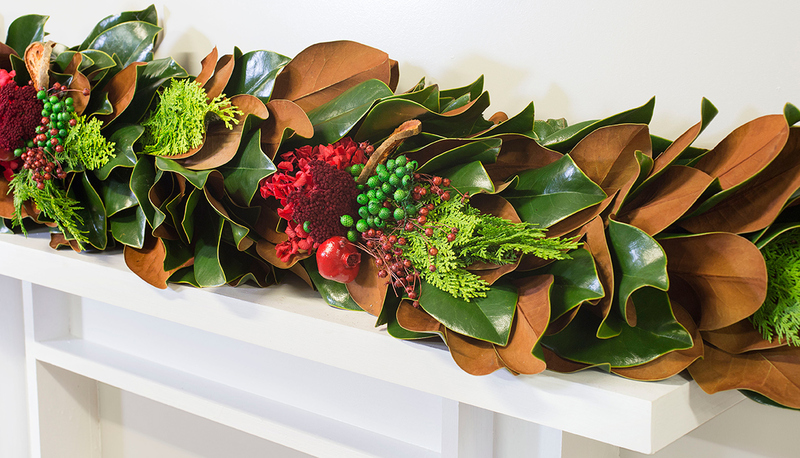 Showcasing a harvest feel while leading into the color of Christmas with sprigs of red berries against our green magnolia leaves, these items are a great investment for this year’s holiday home décor. Choose from a wreath for your front door or mantle; garland to line your favorite door, lamp post, porch columns or entryway; swag for your favorite wall space or door, and a centerpiece for your dining room table. Warm and festive, these pieces capture the feeling of the holiday season. No matter what you choose, know that when you purchase a quality accent piece from The Magnolia Company you are bringing not only style but happiness into your home. Dress up your own space or send a selection to your friends and/or family members. Always know you are celebrating tradition, family, and life’s beauty when choosing a decoration from the The Magnolia Company.